2018-09-13. New global study reveals the ‘staggering’ loss of forests caused by industrial agriculture. By Erik Stokstad, Science Magazine. 2018-06-27. Tropical forests suffered near-record tree losses in 2017. By Brad Plumer, San Francisco Chronicle. 2018-02-02. 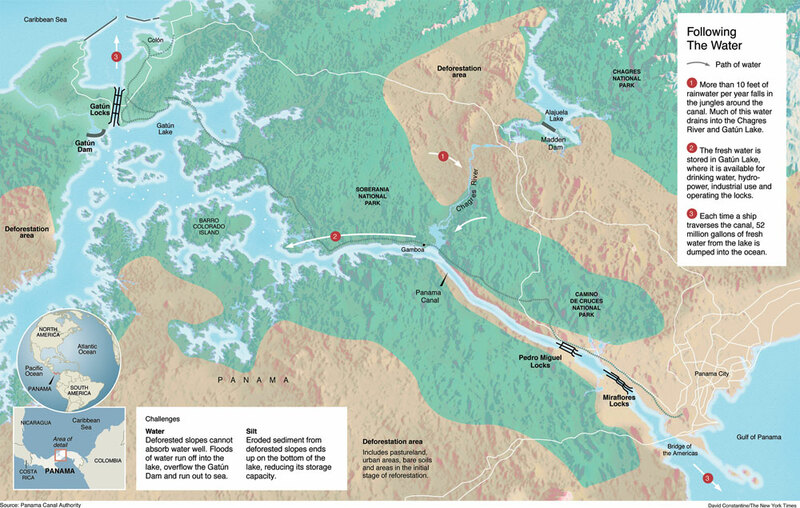 Dams nudge Amazon's ecosystems off-kilter. By Barbara Fraser, Science. 2017-12-05. Sometimes Seeing More Endangered Tigers Isn’t a Good Sign. By Douglas Quenqua, The New York Times. 2015-11-20. Half of all tree species in Amazon 'face extinction'. By Helen Briggs, BBC News. 2015-03-23. Amazon Forest Becoming Less of a Climate Change Safety Net. By Justin Gillis, the New York Times. 2014-10-03. Clashing Visions of Conservation Shake Brazil’s Presidential Vote. Excerpt: From the podium at the United Nations to declarations on the campaign trail, President Dilma Rousseff is celebrating Brazil’s protection of the Amazon. But satellite data released last month shows that Brazil’s annual deforestation rate in the Amazon has climbed again after years of declines, rising 29 percent, leaving her vulnerable to attacks in this nation’s acrimonious presidential race. ...When the security forces here find new signs of illegal deforestation, they often act swiftly, arresting and fining those responsible. They destroy encampments and equipment, setting fire to tractors and logging trucks. Such methods helped lower annual deforestation in the Brazilian Amazon by about 70 percent since 2000. ...But land speculators are adapting. Investigators say that some have assembled a web of informants tracking the movements of the environmental police. At times, small revolts have also erupted, as when dozens of people in a nearby settlement cornered the environmental police at their hotel in May. Then there are tactics like deploying arsonist crews at times of heavy cloud cover or light rains, when detecting fires under the forest canopy by satellite is thought to be harder. ...“This is the Wild West of environmental crimes,” he said. “We are waging an endless war.” ...Though almost 20 percent of the Brazilian Amazon has been cleared since the 1960s and ’70s, Ms. Teixeira said that Brazil could serve as an anti-deforestation example for the developing world. “I would love for the forests of Indonesia or the Congo River Basin to have the same levels of protection we have forged,” she added. Still, Brazil’s deforestation rate could climb for a second consecutive year, after the 29 percent increase from 2012 to 2013. Preliminary data from a satellite-based system showed a 9 percent increase in deforestation alerts, the National Institute for Space Research said in September.... http://www.nytimes.com/2014/10/04/world/americas/brazil-rainforest-amazon-conservation-election-rousseff-silva.html. By Simon Romero, The New York Times. 2014-04-28. Study shows how Brazilian cattle ranching policies can reduce deforestation. Excerpt: There is a higher cost to steaks and hamburgers than what is reflected on the price tags at grocery stores and restaurants. Producing food – and beef, in particular – is a significant source of greenhouse gas emissions, which are projected to grow as rising incomes in emerging economies lead to greater demands for meat. But an encouraging new study by UC Berkeley researchers and international collaborators ..., published today (Monday, April 28) in the journal Proceedings of the National Academy of Sciences, found that by subsidizing more productive use of pastureland, and by taxing those who stick with less sustainable practices, Brazil could cut its rate of deforestation by half and shave off as much as 25 percent of all global greenhouse gas emissions from deforestation. ...“semi-intensive” cattle ranching practices in Brazil...include better management of pastureland by rotating where animals graze, planting better grasses more frequently, and amending the soil to unlock more nutrients. The authors noted that better land management could double productivity of pasturelands compared to conventional practices, thereby reducing the pressure to cut down more trees. ...Over the past several decades, Brazil has risen to become the largest beef exporter in the world. ...“There’s this notion that fighting climate change requires a stark tradeoff for emerging economies, that they must forego development to meet their emissions target,” said Cohn. “This paper suggests that there is a pathway where that compromise may not be needed.”... http://newscenter.berkeley.edu/2014/04/28/brazil-cattle-ranching-deforestation/. By Sarah Yang, UC Berkeley News Center. 2014-02-06. ScienceShot: Fire Is Blackening 'Earth's Lungs'. Excerpt: The vast expanses of rainforest that make up the Amazon Basin have been called the lungs of the planet, as they breathe in carbon dioxide and release oxygen. Now, findings from biweekly airplane flights over the jungle show how a severe drought choked these lungs, constricting the uptake of carbon dioxide, a greenhouse gas. Worse, fires released tremendous amounts of carbon into the atmosphere, exacerbating global warming. ...Scientists are concerned that climate change—with rising temperatures and more droughts—will reduce the rainforest’s storage of carbon and in turn hinder its ability to slow the pace of global warming. http://news.sciencemag.org/climate/2014/02/scienceshot-fire-blackening-earths-lungs. Erik Stokstad, Science Magazine (AAAS). 2013-11-14. NASA-USGS Landsat Data Yield Best View to Date of Global Forest Losses, Gains. Excerpt: The ravages of deforestation, wildfires, windstorms, and insects on global forests during this century are revealed in unprecedented detail in a new study based on data from the NASA-U.S. Geological Survey Landsat 7 satellite. The maps resulting from the study are the first to document forest loss and gain using a consistent method around the globe, at high resolution. They allow scientists to compare forest changes in different countries and monitor annual deforestation. With each pixel in a Landsat image showing an area about the size of a baseball diamond, researchers see enough detail to tell local, regional and global stories. Prior to this study, country-to-country comparisons of forestry data were not possible at this level of accuracy. ...During the study period, Brazil cut its deforestation rate from approximately 15,400 square miles (40,000 square kilometers) per year to approximately 7,700 square miles (20,000 square kilometers) per year. "That's the result of a concerted policy effort to reduce deforestation, and it sets a standard for the rest of the world," Hansen said. ...The team found the deforestation rate in other countries increased. Indonesia's deforestation rate doubled in the study period, from approximately 3,900 square miles (10,000 square kilometers) per year in 2000-2003 to more than 7,700 square miles (20,000 square kilometers) in 2011-2012. ...A different pattern of change appears in the southeastern U.S., where landowners harvest trees for timber and quickly plant their replacements. "Of this eco-region in the southeast, 30 percent of the forest land was regrown or lost during this period," Hansen said. "It's incredibly intensive. Trees are really treated like a crop in this region." In Alabama, Landsat also detected miles-long streaks of destroyed forest. When the researchers examined the year-by-year record, they found the damage occurred in 2011 after a violent tornado season. ...To view the forest cover maps in Google Earth Engine, visit: http://earthenginepartners.appspot.com/google.com/science-2013-global-forest - Source: http://www.nasa.gov/press/2013/november/nasa-usgs-landsat-data-yield-best-view-to-date-of-global-forest-losses-gains/. NASA Release 13-335. 2013-10-11. In Indonesia, Environmentalists See a Disaster in the Making. Excerpt: Aceh, the northern province on the Indonesian island of Sumatra, is a region made famous by separatist conflict and natural disasters, calamities that long held back economic development but helped preserve one of the world’s richest ecosystems. Now conservationists say the rapid clearing of virgin forest is paving the way for environmental catastrophe, turning critically endangered orangutans, tigers and elephants into refugees, and triggering landslides and flash floods. Much of the current activity is illegal, they say, but if a land-use plan proposed by Aceh’s governor, Zaini Abdullah, is approved by the national government, currently protected forests could be rezoned as “production forests,” paving the way for logging, palm oil and mining concessions. The Aceh government argues that the change is needed to develop the local economy.... http://www.nytimes.com/2013/10/12/world/asia/in-indonesia-environmentalists-see-a-disaster-in-the-making.html. Sara Schonhardt, The New York Times. …But since Dilma Rousseff was elected president in late 2010, there have been signs of a shift in the government’s attitude toward the Amazon…. …Now, a bill seeking to overhaul the 47-year-old Forest Code, a central piece of environmental legislation, is the most serious test yet of Ms. Rousseff’s stance on the environment. The debate over the law has revealed the stark disconnect between a population that is increasingly supportive of conserving the Amazon and a Congress in which agricultural interests in the country’s rural north and northeast still hold sway. The furor comes as Brazil is set to hold a United Nations conference on sustainable development in Rio de Janeiro in June…. Greg Goldsmith has his head in the clouds. But the University of California, Berkeley, graduate student is also firmly grounded in today’s reality: the Central American cloud forests he loves are threatened by global warming…. …To spread the word, Goldsmith teamed up with two visual artists to capture breathtaking, high-definition photos and video of a cloud forest in Costa Rica and then incorporated them into a middle-school curriculum, “Canopy in the Clouds,” about this unique but endangered ecosystem…. Fall 2011. The Root of the Problem. By Calen May-Tobin Catalyst, Union of Concerned Scientists. Excerpt: Humans have been using and clearing forests for thousands of years, but what was once a local practice with localized impacts is now a global problem. Tropical deforestation not only accounts for around 15 percent of the world’s heat-trapping emissions, but also affects the biodiversity and the livelihoods of forest peoples. To stop this problem we must first understand what is driving it. As we found in our new report, The Root of the Problem, many assumptions about the “drivers” of tropical deforestation are no longer accurate, with new drivers taking precedence over traditional ones. And recent actions to deal with some of these driving forces show that deforestation can be slowed—or even stopped—in the next few decades…. [Download the the full UCS report The Root of the Problem]. 2011-05-31. New NASA Map Reveals Tropical Forest Carbon Storage | NASA. Excerpt: ADENA, Calif. – A NASA-led research team has used a variety of NASA satellite data to create the most precise map ever produced depicting the amount and location of carbon stored in Earth's tropical forests. The data are expected to provide a baseline for ongoing carbon monitoring and research and serve as a useful resource for managing the greenhouse gas carbon dioxide. The new map, created from ground- and space-based data, shows, for the first time, the distribution of carbon stored in forests across more than 75 tropical countries. Most of that carbon is stored in the extensive forests of Latin America. ...Deforestation and forest degradation contribute 15 to 20 percent of global carbon emissions, and most of that contribution comes from tropical regions. Tropical forests store large amounts of carbon in the wood and roots of their trees. When the trees are cut and decompose or are burned, the carbon is released to the atmosphere. ...The map reveals that in the early 2000s, forests in the 75 tropical countries studied contained 247 billion tons of carbon. For perspective, about 10 billion tons of carbon is released annually to the atmosphere from combined fossil fuel burning and land use changes. The researchers found that forests in Latin America hold 49 percent of the carbon in the world's tropical forests. For example, Brazil's carbon stock alone, at 61 billion tons, almost equals all of the carbon stock in sub-Saharan Africa, at 62 billion tons.... See full article at http://www.nasa.gov/topics/earth/features/earth20110531.html. 2011 March 29. NASA RELEASE 11-090: NASA Satellites Detect Extensive Drought Impact On Amazon Forests. Excerpt: WASHINGTON -- A new NASA-funded study has revealed widespread reductions in the greenness of Amazon forests caused by last year's record-breaking drought…. …The comprehensive study was prepared by an international team of scientists using more than a decade's worth of satellite data from NASA's Moderate Resolution Imaging Spectroradiometer (MODIS) and Tropical Rainfall Measuring Mission (TRMM). Analysis of these data produced detailed maps of vegetation greenness declines from the 2010 drought…. 2011 March 21. As Larger Animals Decline, Forests Feel Their Absence. By Sharon Levy, Environment 360 (Yale). Excerpt:…Today native Mauritian plants, under siege from a tide of invasive competitors and predators, hang on only in a few small conservation management areas. Even where invasive plants are laboriously weeded out by hand, large-fruited native tree populations are dwindling because of a lack of fruit-eating animals to disperse the trees’ seeds…. …As part of a restoration effort on Ile aux Aigrettes, an uninhabited islet off the Mauritius coast, the Mauritius Wildlife Federation and the Mauritius government in 2000 introduced giant Aldabra tortoises to test whether the tortoises could help revive native vegetation. The tortoises are now dispersing the seeds of several native plants and are knocking back an invasion of the exotic tree, Leuceana leucocephala, by devouring its seedlings…. 2010 July 17. Ranchers and Drug Barons Threaten Rain Forest. By Blake Schmidt, The New York Times. Excerpt: EL MIRADOR, Guatemala — Great sweeps of Guatemalan rain forest, once the cradle of one of the world’s great civilizations, are being razed to clear land for cattle-ranching drug barons. Other parts of the Maya Biosphere Reserve, Central America’s largest protected area, have been burned down by small cities of squatters. Looters and poachers, kept at bay when guerrilla armies roamed the region during the country’s 36-year civil war, ply their trades freely. …President Álvaro Colom has grand plans to turn the region into a major eco-tourism destination, but if he hopes to bring tourists, officials say, he will have to bring the law here first. ...To Mr. Hansen, an Idaho State professor of archaeology, the risks of not protecting the region are obvious in every stone he unearths. The Maya, he said, largely sealed their fate through deforestation and erosion. 2010 July 1. The Cost of Saving the Rainforest. By Tom Hennigan, The Irish Times. Excerpt: …For decades it seemed a losing struggle, as the annual dry season led to the setting of fires that burned away ever more of the jungle’s southern rim. But now there is tentative hope that this decades-long cycle of destruction is drawing to a close. In the past three years Brazil’s government has finally moved to control the region and is clamping down on deforestation. Jungle is still being cleared, but at just half the rate of before. Last year was the Brazilian Amazon’s best since 1988. Even many environmentalists are cautiously hopeful that the rainforest now stands a chance. …The ranchers of Castanheira, 800km north of Cuiabá on the western edge of the BR-163’s corridor of destruction, all agree that times have changed. Today only a foolish or desperate man would burn down a patch of forest without a permit, and the authorities are no longer handing those out. “The government is watching too closely now. If you clear land then you get fined, and the fine is worth more than the land you clear,” says the town’s former mayor Genes Oliveira Rios. …Brazilian governments long feared that the largely uninhabited Amazon was vulnerable to covetous outsiders, and in the 1970s the military dictatorship decided it was time to settle it. Under the banners “Integrate or Forfeit” and “A Land without Men for Men without Land” it handed out chunks of the forest for a pittance to anyone who wanted them. The only condition? To secure their claim settlers must clear half their property of jungle. …But still the fear lingers that the outside world wants to force them from their homes, an idea reinforced when a leading official in Brazil’s environment ministry once told them that if they wanted to remain cattle ranchers they would have to move out of Amazonia. 2010 June 24. The Other Oil Spill. By The Economist. Excerpt: …EARLY on April 21st 2008, Greenpeace activists dressed as orang-utans stormed Unilever’s headquarters in London. Similar raids took place at the multinational’s facilities on Merseyside, in Rome and in Rotterdam. Furry protesters scaled buildings, occupied production lines and unfurled banners. Many read: “Unilever: Don’t Destroy the Forests”. Dove, one of the company’s best-known brands, was singled out by name. …The tactic was a simple one, intended to draw attention to the damage done to Indonesian tropical rainforests by the production of palm oil, an ingredient in many of Unilever’s products. It was also effective: soon after the orang-utan invasion the company said it would draw all its palm oil from “sustainable” sources by 2015. …The charges against palm oil are serious: environmental groups regard it as a danger not only to Asian wildlife but also to the health of the planet. Between 1967 and 2000 the area under cultivation in Indonesia expanded from less than 2,000 square kilometres (770 square miles) to more than 30,000 square kilometres. Deforestation in Indonesia for palm oil and illegal logging is so rapid that a report in 2007 by the United Nations Environment Programme (UNEP) said most of the country’s forest might be destroyed by 2022. Although the rate of forest loss has declined in Indonesia in the past decade, UNEP says the spread of palm-oil plantations is one of the greatest threats to forests in Indonesia and Malaysia. …In fact in response Nestlé went further than any company had gone before. It undertook to exclude companies running “high-risk plantations or farms linked to deforestation” from its supply chain. To make this happen, Nestlé has recruited the Forest Trust (TFT), a charity based in Switzerland, to provide an independent review of its palm-oil supply chains, right down to ground level. Every supplier will be audited for evidence of illegal activity. 2010 June 8. Using the Internet to Save the Rainforest. By Juliane Von Mittelstaedt, ABC News. Excerpt: …The Surui will be soon be one of the first indigenous peoples that will be paid by the world to preserve its forest. They are being advised by investment bankers, lawyers, and managers. But the decisions will be all their own, taken at a gathering of 1,300 native Indios. Almir Surui believes his people need modernity to help them maintain their traditional way of life, that this is the only way they can save their forest, their culture, and their tribe. But because it is an experiment, the outcome is uncertain -- for both the Surui and the rest of the world. …Just last year, 130,000 square kilometers of forest was cut down or burnt, at least 10,000 square kilometers of this in Brazil. That may be the lowest figure in decades, but it's still too much. Twenty percent of the Amazon rainforest has already disappeared. The same amount has been damaged. On a purely proportional scale, the greatest amount of forest has been lost in the state of Rondônia. …When the chief returned to his village, he brought with him a computer and an idea: that the Surui's only hope for survival lay in combining the two worlds of technology and tradition. It was the dawn of a new era. …The chief's words convinced nearly all the Surui, who avidly began breeding and planting seedlings. Gradually the forest returned. Ignoring the rain and the heat, they planted more and more species: Açai palms, Ipé (trumpet trees), Brazil nut, mahogany. Women, children, and the elderly all lent a hand, clearing scrubland that looks like forest but is no more than brushwood, palm trees, and ferns. They are still planting to this day. …Almir Surui first heard the term REDD -- or "retchy", as he pronounces it -- three years ago. The acronym stands for Reducing Emissions from Deforestation and Forest Degradation. He discovered that forests trap carbon dioxide, and companies around the globe are willing to pay a lot of money to have the trees soak up carbon dioxide on their behalf. They don't pay for a forest that is merely in existence, but rather for preventing its destruction. 2010 May 26. Kids' Books not Safe for Rainforests. By Rebecca Tarbotton, Huffington Post. Excerpt: …What do major U.S. publishing houses, China and tropical rainforest destruction have in common? Children's books. That's right, a report put out this week by Rainforest Action Network found that a majority of the top ten U.S. children's publishers have sold at least one children's book that tested positive for paper fiber linked to the destruction of Indonesia's endangered rainforests. And all of those books were produced in China. ...The razing of the Indonesian rainforests for commodities like paper and palm oil has destroyed the habitats of these endangered species and contributed to making the archipelago the third-largest source of greenhouse gases after the U.S. and China. Worldwide, the degradation and destruction of tropical rainforests is responsible for fifteen percent of all annual greenhouse emissions. The carbon emissions resulting from Indonesia's rapid deforestation account for up to five percent of global emissions: more than the combined emissions from all the cars, planes, trucks, buses and trains in United States. …There is no reason that Indonesia's critical rainforests need to be cut down for our children's books. Rainforest- free paper is a readily available alternative that publishers can demand from suppliers. If top U.S. book publishers demand cleaner paper, Chinese manufacturers will give it to them. 2010 Feb 16. Big business leaves big forest footprints. By Andrew Mitchell, BBC News. Excerpt: ...A new report by Forest Footprint Disclosure reveals for the first time how global business is driving rainforests to destruction in order to provide things for you and me to eat. But it does also reveal what companies are doing to try to lighten their forest footprint. Sadly, however, the answer is: not much, at least not yet. Because of growing demand for beef, soy and palm oil, which are in much of what we consume, as well as timber and biofuels, rainforests are worth more cut down than standing up. ...The gargantuan farms of Brazil's Mato Grosso State can boast 50 combines abreast at harvest time, marching across monoculture prairies where once the most diverse ecosystem on Earth stood, albeit in some cases many years ago. Further north, thousands of square miles of rainforest natural capital is going up in smoke each year, often illegally, to provide pastureland for just one cow per hectare to supply beef hungry Brazilians or more prosperous mouths in China and India. Many of the hides from these cattle then go into the designer trainers, handbags or luxury car upholstery that wealthy markets have such an appetite for. ...None of this would matter but for three things. Firstly, evolution is being changed forever. Most of us, sadly, can live with that. Secondly, burning tropical forests drives global warming faster than the world's entire transport sector; there will be no solution to climate change without stopping deforestation. 2009 March 9. Amazon Rainforest Carbon Sink Threatened By Drought. Science Daily. Excerpt: The Amazon is surprisingly sensitive to drought, according to new research conducted throughout the world's largest tropical forest. The 30-year study, published in Science, provides the first solid evidence that drought causes massive carbon loss in tropical forests, mainly through killing trees. The 2005 drought sharply reversed decades of carbon absorption, in which Amazonia helped slow climate change. In normal years the forest absorbs nearly 2 billion tonnes of carbon dioxide. The drought caused a loss of more than 3 billion tonnes. The total impact of the drought - 5 billion extra tonnes of carbon dioxide in the atmosphere - exceeds the annual emissions of Europe and Japan combined. "Visually, most of the forest appeared little affected, but our records prove tree death rates accelerated. Because the region is so vast, even small ecological effects can scale-up to a large impact on the planet's carbon cycle," explained Professor Phillips. 2008 March 5. Amazon Fires on the Rise. By Rebecca Lindsey , NASA Earth Observatory. In 2006, fires and smoke in the Amazon declined significantly for the first time in nearly a decade. Is Amazon burning under control? 19 September 2006. GROWTH IN AMAZON CROPLAND MAY IMPACT CLIMATE AND DEFORESTATION PATTERNS - Scientists using NASA satellite data have found that clearing for mechanized cropland in the Brazilian Amazon may alter the region's climate and the land's ability to absorb carbon dioxide. NASA Earth Observatory. 28 June 2006. Mapping the Changing Forests of Africa. by Stephanie Renfrow. From NASA DAAC Supporting Earth Observing Science collection of research articles. Excerpt: In the Central African Bwindi forest in Uganda, a gorilla sits on the forest floor nursing her young. A few miles away, a subsistence farmer burns a patch of forest in preparation for a crop that will feed his family. And as the smoke from the burning forest floats into the sky, carbon dioxide (CO2) drifts into the Earth's atmosphere. The gorilla, the farmer, and the burning forest's emissions are interconnected by a single phenomenon: a change in the way people use land. More than 900 million people live in Africa, and many of them rely on traditional slash-and-burn agriculture to survive lives of profound poverty. ...up to a third of all global CO2 emissions comes from land-use changes, including agricultural fires. Carbon dioxide is one of the greenhouse gases that is causing our planet's average surface temperatures to rise. ... Land-use change also affects and threatens entire ecosystems and the plants and animals within them. In the case of the Central African forests, land-use change has contributed to pushing three species of Great Ape to the edge of extinction. Sadly, the very people who burn the forests to survive can deepen their own plight if they run out of the vital fuel and resources the forests provide. 6 June 2006. A Rain-Forest Census Takes Shape, Tree by Tree. By NANCY BETH JACKSON. NY Times. Excerpt: PANAMA - In 1979, two ecologists at Midwestern universities ... came up with an audacious plan. They wanted exclusive rights to the top of Barro Colorado, a six-square-mile research island that had become one of the most studied spots on earth. The island, a biological reserve in the Panama Canal, was administered by the Smithsonian Tropical Research Institute, so the two scientists, Robin Foster, then at the University of Chicago, and Stephen P. Hubbell, then at the University of Iowa, approached the institute's director, Ira Rubinoff, and proposed mapping and measuring every tree every five years to monitor population changes and to test conflicting theories about diversity in tropical forests. Their audacity lay in their asking to bar all other scientific inquiries from their plot, to prevent tiny seedlings from being squashed by scholarly boots. ...New technologies speed, simplify and expand the work at the plots. Census takers can find their way in the forest with global positioning devices and access and enter information on their personal digital assistants. Canopy towers, photos from airplanes and satellites, and DNA analysis are other tools now being tapped by plot researchers. At some camps, however, ...Scientists make do without electricity, wash their clothes in rivers and cook over open fires. Corneille E. N. Ewango, monitoring the 100-acre Ituri Forest plot established in 1994 in Congo, received the Goldman Environmental Prize last year for hiding data on 600 species and 380,000 trees during a civil war. He himself hid in the forest for three months rather than desert his post. "Though my country has the largest forest in Africa, it is one of the least known. We don't have so much research in botany in the Congo, except what we are doing," he explained when the prize was announced. BERKELEY - Trees, particularly those with deep roots, contribute to the Earth's climate much more than scientists thought, according to a new study by biologists and climatologists from the University of California, Berkeley. While scientists studying global climate change recognize the importance of vegetation in removing carbon dioxide from the atmosphere and in local cooling through transpiration, they have assumed a simple model of plants sucking water out of the soil and spewing water vapor into the atmosphere. The new study in the Amazonian forest shows that trees use water in a much more complex way: The tap roots transfer rainwater from the surface to reservoirs deep underground and redistribute water upwards after the rains to keep the top layers moist, thereby accentuating both carbon uptake and localized atmospheric cooling during dry periods. The researchers estimate this effect increases photosynthesis and the evaporation of water from plants, called transpiration, by 40 percent in the dry season, when photosynthesis otherwise would be limited. ...said co-author Todd Dawson, professor of integrative biology at UC Berkeley... "Because this has not been considered until now, people have likely underestimated the amount of carbon taken up by the Amazon and underestimated the impact of Amazonian deforestation on climate." 24 May 2005. To Save Its Canal, Panama Fights for Its Forests. NY Times. By CORNELIA DEAN. Excerpt: MIRAFLORES, Panama - A freighter slides slowly into the first of the Miraflores Locks, red, orange and white cargo containers stacked six or seven high on its deck. Gates swing shut and the lock begins to drain, water flowing into the lock below. A few minutes later, when the water levels are equal, gates at the other end of the lock swing open, and the ship moves into the next chamber. Once again, water drains, gates open and the ship and its tons of cargo head out to the Pacific Ocean. Something else is moving, too - about 26 million gallons of water, the amount that drains from the Pedro Miguel and Miraflores Locks each time a ship goes through them to or from the Pacific. ...The water comes from Gatún Lake, one of the largest artificial lakes in the world, created during construction of the canal. The canal depends on the lake and its water, and they in turn depend on the health of the surrounding watershed forest. But in the last few decades, half of it has been lost to logging and slash-and-burn agriculture. ...The Panama Canal Authority and an array of scientists are working together to study Gatún Lake's hydrology, to restore its watershed and to teach the people who live there the importance of preserving it. ...Water per se is not its problem. The Chagres drains a tropical jungle where it rains 10 feet or more each year - about three times as much as it rains in Seattle or New York, and in theory more than enough to keep the locks operating at capacity. But the rain does not fall steadily year-round. Most of it comes from May to December, in brief but intense downpours. An inch in an hour is ordinary, and six inches in a day is hardly unheard of. Rain falls so heavily in Panama that early canal builders described storms as turning the air to water. On forested slopes, much of this water soaks into the ground and feeds slowly into watershed streams and then into Gatún Lake. But deforested slopes cannot absorb heavy rains. Floods of water run off into the lake, overflow Gatún Dam and run out to sea - useless for lockage. Meanwhile, eroded sediment ends up on the lake bottom, reducing its storage capacity. ...Despite the building of a railroad across the isthmus in the 19th century, the completion of the canal in 1914 and the military buildups of World Wars I and II, the watershed forest was more or less intact until about 1950, Dr. Heckadon said in an interview. ..."Pretty soon we ended up with 3,000 kilometers of trails built by loggers and followed by cattlemen and slash-and-burn farmers," Dr. Heckadon said. In the Chagres basin and in the watershed on the other side of the canal, thousands of acres fell to their machetes and chain saws. ...Panamanians were such assiduous practitioners of slash-and-burn agriculture that some here began to joke bitterly that they must be born with machetes in their hands. Deforestation peaked in the 1980's, said Dr. Robert F. Stallard, a geologist at the Smithsonian research institute in Panama who studies the hydrology of the watershed. By 2000, when Dr. Heckadon and his colleagues completed a study using satellite imagery and ground surveys, they found 53 percent of the watershed forest had been lost. ...efforts are also under way to restore damaged landscapes. A.C.P. has begun a program called the Native Species Reforestation Project - a cooperative arrangement with the Smithsonian, the Yale University School of Forestry, the International Development Center at the Kennedy School at Harvard and other universities and agencies to study ways to protect the canal watershed and restore its native vegetation. The scientists are learning as they go, because little is known about reforesting tropical rain forests, said Dr. Mark S. Ashton, a professor of forest ecology at Yale. 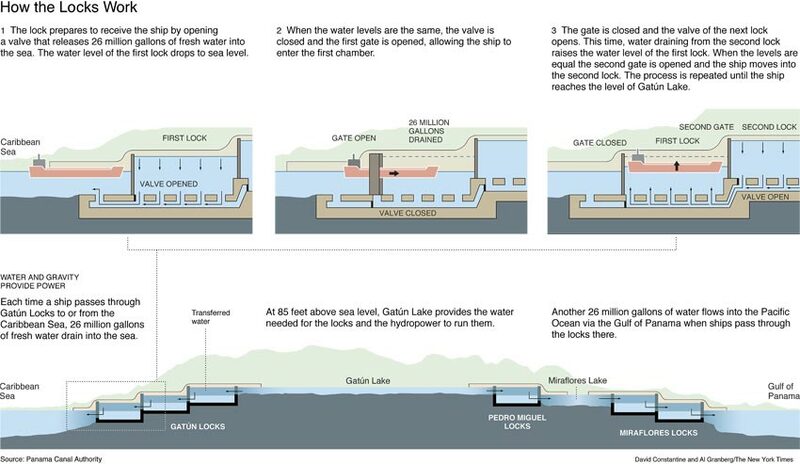 The water to operate Panama Canal locks like Miraflores flows down from Gatún Lake, which depends on the health of the surrounding watershed forest. 8 March 2005. STEALING FROM THE RAINFOREST. Ecologist Dan Nepstad of the Woods Hole Research Center is engaged in an activity that might seem crazy for someone who cares about forests as much as he does. For the past two years, this veteran of tropical forest research has been stealing the rain over two and half acres of forest in the eastern Amazon. February 2005. American Forests - http://www.americanforests.org/ - Planting trees to help the environment. NASA satellite data are giving scientists insight into how large-scale deforestation in the Amazon Basin in South America is affecting regional climate. Researchers found during the Amazon dry season last August, there was a distinct pattern of higher rainfall and warmer temperatures over deforested regions. ... The study is in a recent American Meteorological Society Journal of Climate. Lead authors, Andrew Negri and Robert Adler, are research meteorologists at NASA's Goddard Space Flight Center (GSFC), Greenbelt, Md. ... "In deforested areas, the land heats up faster and reaches a higher temperature, leading to localized upward motions that enhance the formation of clouds and ultimately produce more rainfall," Negri said. November 1998. Tropical Deforestation. NASA Earth Science Enterprise Series, Fact Sheet: FS-1998-11-120-GSFC [2.5MB PDF] The clearing of tropical forests across the Earth has been occuring on a large scale basis for many centuries. This process, known as deforestation, involves the cutting down, burning, and damaging of forests. Canopy in the Clouds - A project that uses immersive multimedia from the tropical montane cloud forests of Monteverde, Costa Rica as a platform for earth and life science education. Includes 26 lessons on topics ranging from science process skills to soil science to ecology. Natural Resources Defense Council (NRDC) Nature's Voice Online.